LIGHT IT UP: A Christmas tree with lights and presents more than suffices for décor this time of year, says Tara. She added simple metallic balls and her children’s homemade ornaments to the mix. TIP: Tara’s go-to for “thick, gorgeous foil wrapping paper” is T.J. Maxx. 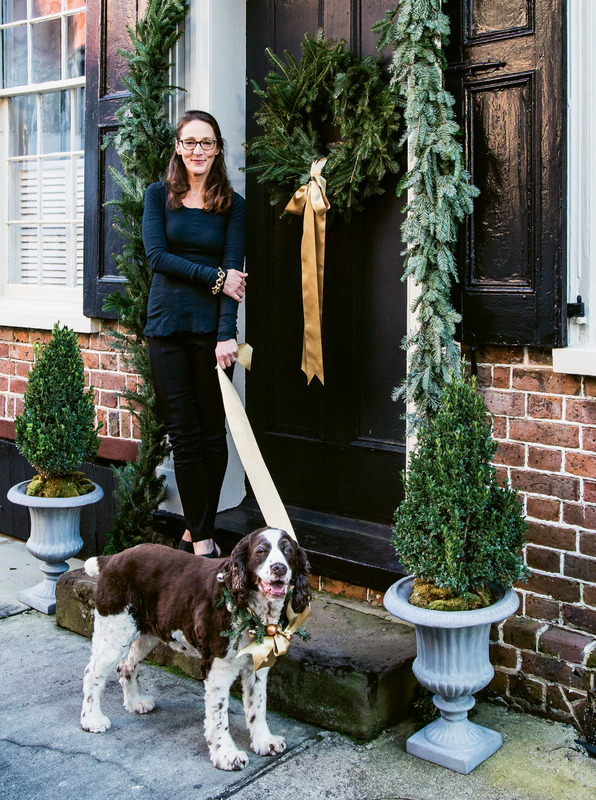 WELCOME HOME: Tara and her English springer spaniel, Georgia, greet guests as they arrive to their Tradd Street home. SHOP AT HOME: Georgia sports a posh collar made from choice Christmas scraps: ribbon from wrapping presents, a few “borrowed” ornaments, and sprigs from the tree. STYLE & SUBSTANCE: While Tara leaves plating garnishes to her cheesemongers (she loves the sprigs of rosemary and colorful pickled vegetables and dried fruits Goat.Sheep.Cow. adds), she has a few handy accents herself. Pomegranates, she says, are long-lasting holiday décor that you can pick up inexpensively at the grocery store. Another grocery find? Saga blue cheese from Harris Teeter. “It’s inexpensive, delicious, and one of my favorites,” she notes. As for toasting bread, she only crisps day-old fare. “When it’s fresh, enjoy it fresh,” she suggests. DRESS FOR SUCCESS: If your gathering is casual festive, pass that on to guests to avoid what-to-wear anxiety. 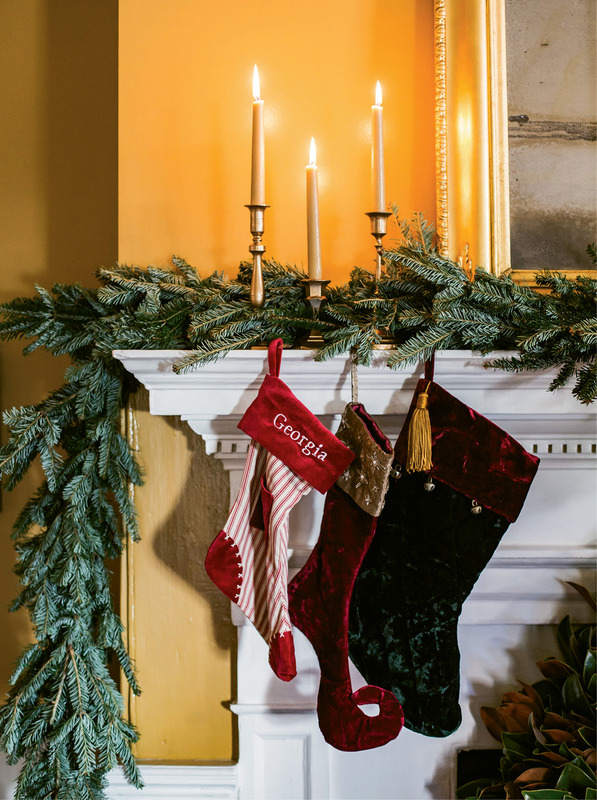 HANG WITH CARE: Simply weaving garlands amid mantel decorations works for Tara, as does lighting candles. “Just don’t burn scented candles around food,” she says. 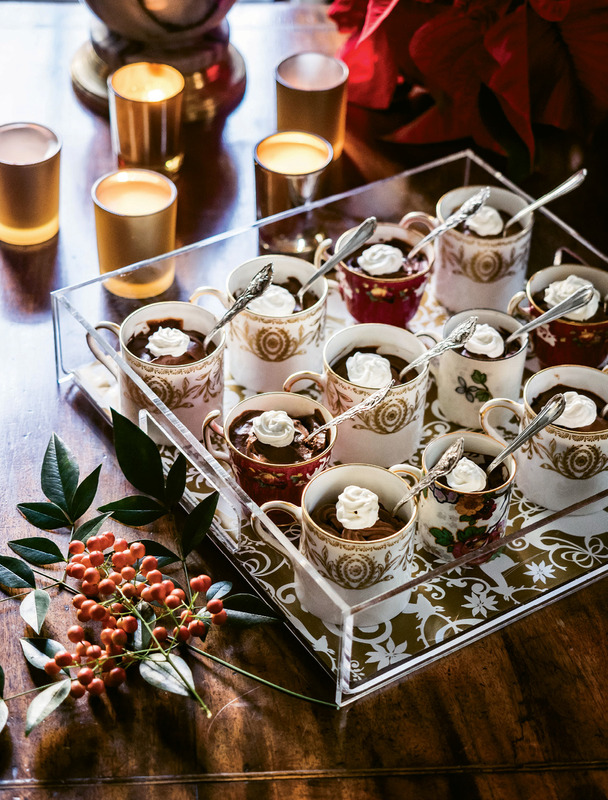 Serving chocolate pots de crème in vintage china cups makes them extra special. Nationally, Tara Guérard is known as one of the country’s top event maestros—her Tara Guérard Soirée has appeared on best planner lists from Vogue, Harper’s Bazaar, Martha Stewart Weddings, and more. 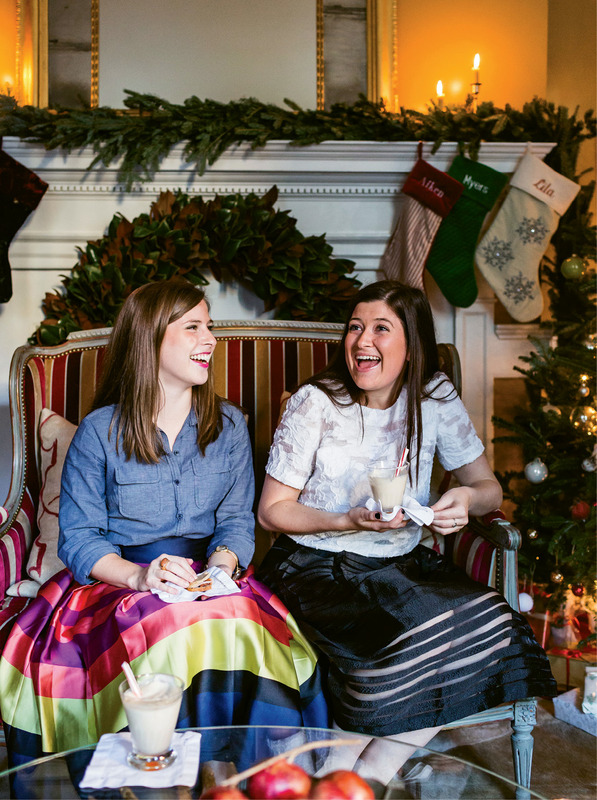 But here in Charleston, the mom of three is known as a fun-loving hostess who combines old-school Holy City etiquette with a vivacious personality and her own brand of covetable panache. 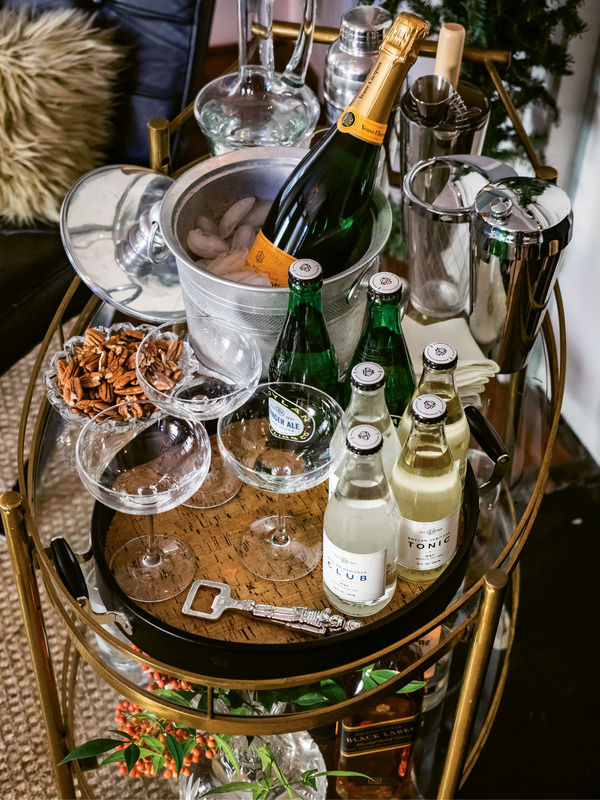 To host an easy, intimate soirée for you and yours, Tara has a few suggestions. 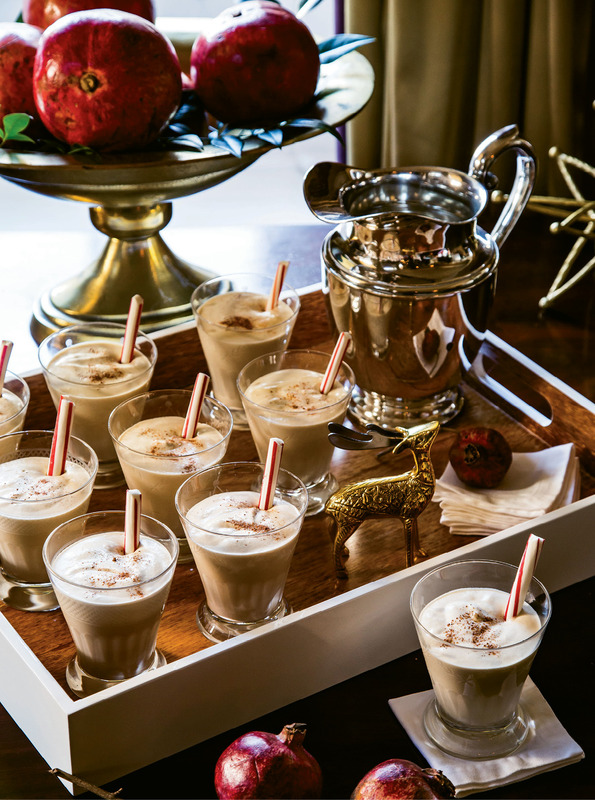 For starters, lean on your existing holiday décor to dress your gathering with festive flair. Next, keep your refrigerator and pantry stocked with cheeses, nuts, and crackers, and your bar packed with essentials. Want specifics and a fail-safe setup like hers that makes entertaining at the drop of a hat (well, let’s say with 24-hour notice) a cinch? Read on. Skip the paper (and paperless) invites. 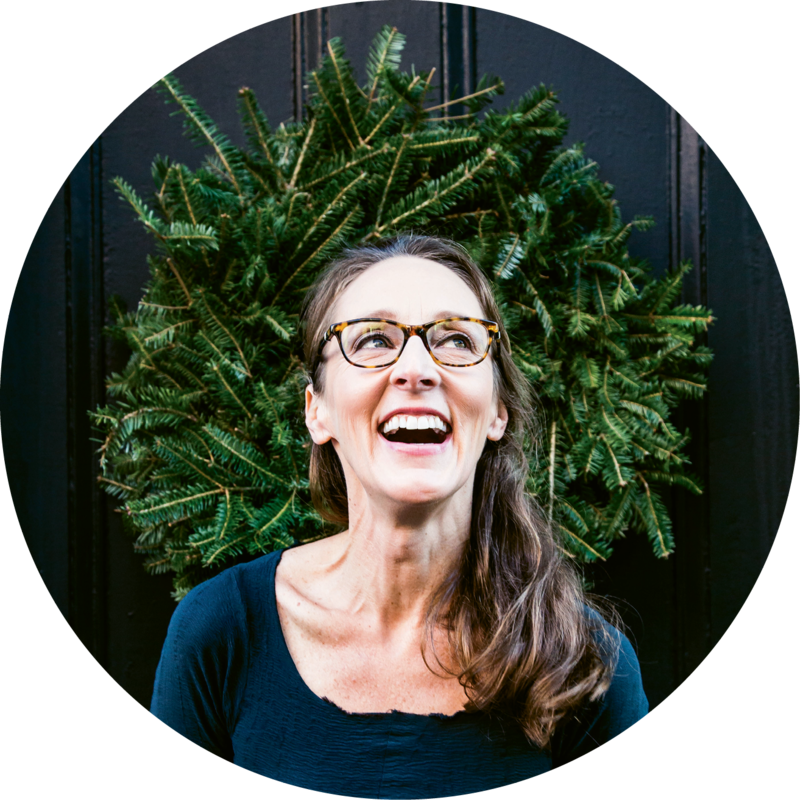 Tara may own the letterpress stationer Lettered Olive, but she says that for an informal gathering of 20 or fewer guests, phone calls make the best, least hassle, most personal invitations. Brush up on your besties. Who has food allergies? Drinks only this or that? Know your pals’ preferences and you can make them feel at home in your home. Be a music maker. Set the mood with good tunes; a go-to holiday album: The A Charlie Brown Christmas soundtrack. Get your glow on. Lower dimmers for a flattering, cozy glow. Don’t have them installed? After 6 p.m., use lamps and candles instead. And no matter what, she advises, skip LEDs. Opt for greens. 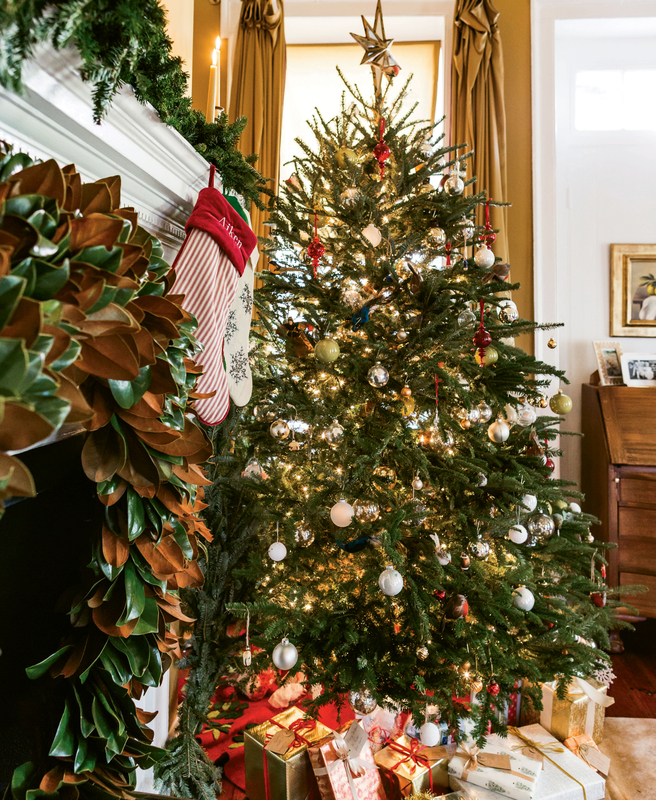 Evergreen garlands, wreaths, and boughs are her favorite long-lasting decorating materials. “A drink in hand makes a happy guest,” says Tara, who started off in the hospitality world ordering vino for a local restaurant before switching to an event-staffing position elsewhere. That mix—knowing what to serve and the ins-and-outs of service—is a hallmark of her seamless events. And as for food versus beverage? “I’m more worried about running out of drinks than food,” she says. Stock up. 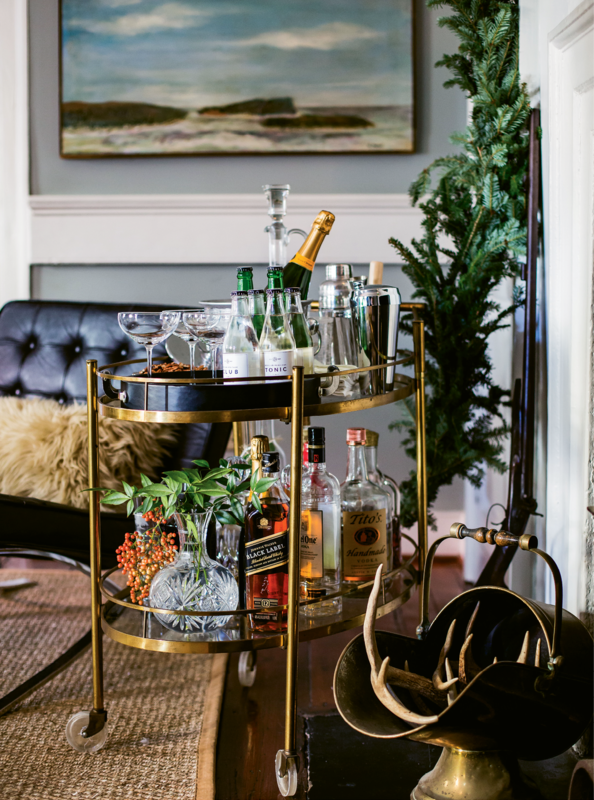 Check out the must-haves for a home bar below. Help them help themselves. Ask guests their drink preference, serve them the first one, then show them the bar so they can pour their own thereafter. Have a backup bar. “Have one bottle of each of the basics then backup seconds stashed away,” says Tara regarding smaller get-togethers. Be mindful. Appoint a friend-bartender to keep an eye on the ice bucket and refill as needed. Same goes for lemons and limes. Go for cute. Quaint mixer or seltzer bottles make a sea of liquor bottles look more personal, Tara says. “At an informal party like this,” says Tara, “I want guests to be able to lean over the coffee table and help themselves to a little cheese and crackers. It’s almost impossible to hold a glass, plate, and fork at a cocktail party, so offer self-serve finger foods with napkins. It’s the older, more proper way to serve a handful of guests.” Add some ham biscuits and soup in small cups, and you’re set. If the guest list rises above 20 to 25, she suggests rethinking the menu and hiring a server for bussing and restocking. Enlist help. Tara’s favorite charcuterie platter is anything that Goat.Sheep.Cow puts together for her. “Tell them the number of guests, size of serving (appetizer versus course), and your price range per person or total,” she advises. Don’t go crazy. “I ask for an assortment of crowd-pleasing cheeses and meats. If you go too out there, most people aren’t going to touch it.” Otherwise, allow the pros to make the picks—they know what’s freshest and most popular. Let the pros plate everything. 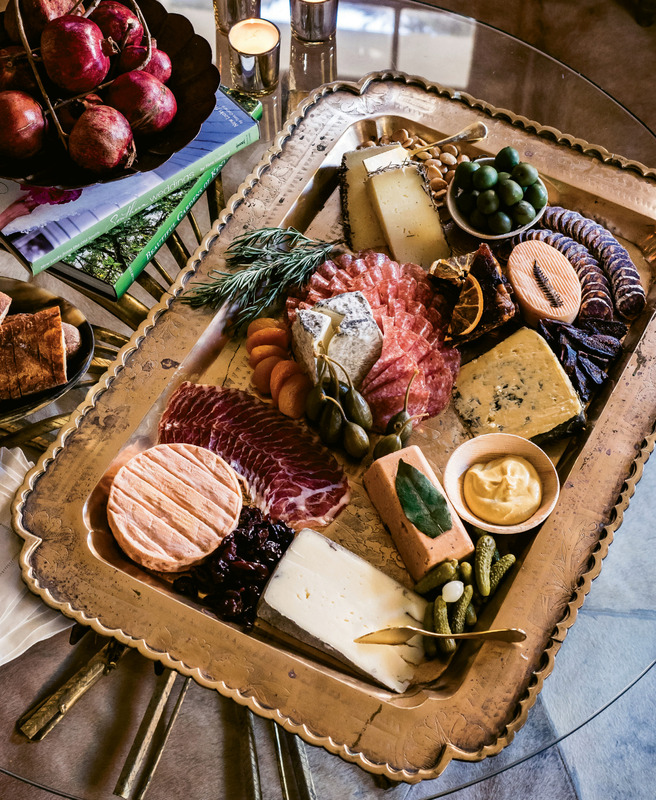 Tara takes a favorite brass tray (another vintage find that works great for meat and cheese) to the Church Street shop and asks them to style the selections on the platter. Skip the labels. Any glance at Pinterest shows a slew of picture-perfect apps with tidy signs proclaiming what’s what. Pass on the verbiage for a small gathering, says Tara, as you can talk out the offerings. It makes for good ice breakers and conversation, she adds. Play with knives. Tara collects cheese knives, especially those with horned handles. She also has a weak spot for the gold S-piece slim cheese knife set ($49) by CB2. Mix and match the high-end finds with the steals. Wipe your mouth, dear. A cotton or linen cocktail napkin is the only way to go, says Tara. “Polyester doesn’t absorb anything.” Her most cherished napkins are from The Boutique on Broad Street and crisply laundered collections from antiques shops. While Tara generally lets her cheese shop pick specific varieties for her platters, here’s an overview of what, at minimum, she likes to include: manchego, cheddar, and soft blue cheeses; proscuitto, sausage, pâté, and mustard; cornichons, pickled beets, dried fruit, and almonds; as well as crackers and French bread. ATTENTION TO DETAIL: The right serving pieces make desserts as much a feast for the eyes as they are otherwise. Here, a home-style caramel cake from Halls Chophouse is elevated when showcased on a tall cake stand. Add color. 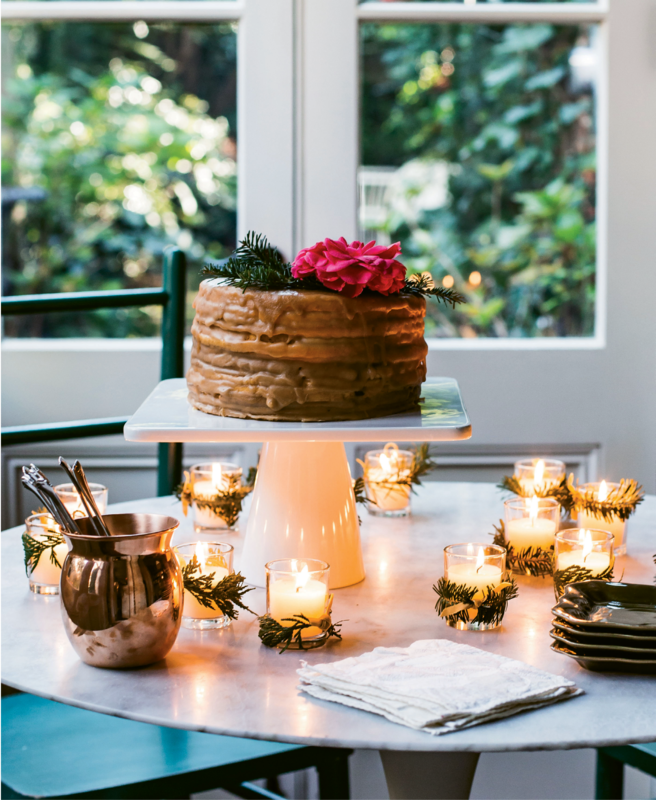 The caramel cake needed a little embellishment, says Tara, so she plucked a camellia from her courtyard and paired that with evergreen sprigs. Jazz up simple votives. Tara cut branch snippets from extra Christmas greenery, wrapped them around inexpensive glass votives, bound the ends with floral wire, and tied them off with ribbon. Order baked goods at least a day before you need them. While some take-out party fare can be utterly last-minute, most kitchens prefer at least a few day’s lead time, especially during the holidays. Choose china or silver plates. Desserts call for something more substantial than napkins. Cut the cake. When guests seem ready for sweets, Tara cuts the cake herself and serves everyone slices. “You don’t want anyone else getting all sticky,” she says. Line trays with wrapping paper. Tara gave her platter of pots de crème (at right) a holiday touch. 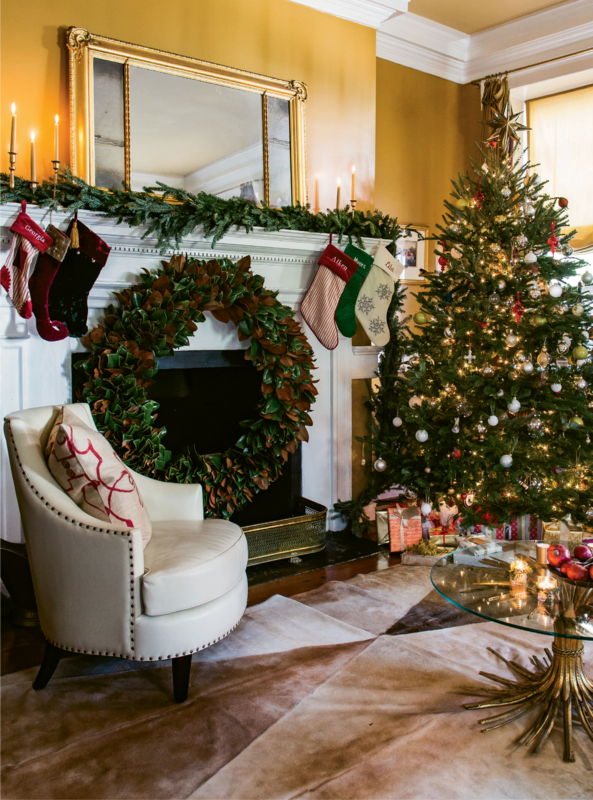 Here’s what the owner of Tara Guérard Soirée says comes in handy when you’re decorating at home for the holidays. She packs her “tools” in a handy canvas tote that she has at the ready from November to January. 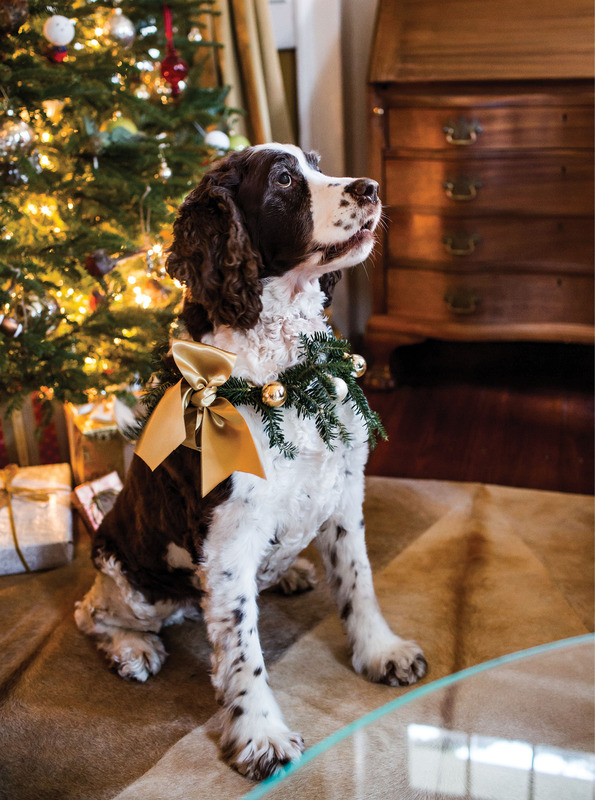 Use these elements for hanging evergreen wreaths and garlands, tagging gifts and more, and even crafting a festive collar for your pooch.